Brinsley Colliery. 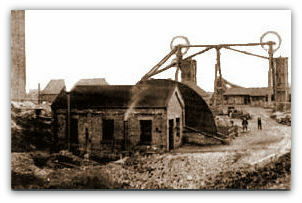 A Barber and Walker Colliery near Eastwood, Brinsley (1872-1970). Brinsley Colliery was originally 450 feet (137m) deep but by the 1870s the good quality 'top hard' coal had been almost exhausted and a second shaft was sunk in 1872 to a depth of 780 feet (238m). 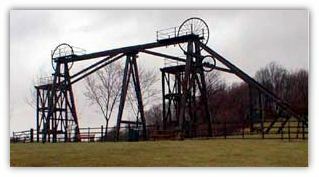 The 'tandem' headstocks, were erected at this time. Each cage was suspended from a steel cable and held six men. The cable passed over the winding wheels to the drum of a steam winding engine. The beams were made of wood. At its peak of production the colliery produced around 500 tons of coal a day and employed 361 men, 282 of whom worked at the coal faces. It was here that D H Lawrence's father worked from six in the morning till four in the afternoon he crouched in an 18-inch coal seam. Now you can picnic beneath the headstocks, approaching them via a path which was the route of the railway line from the pit to Langley Mill. I am trying to find some information on my Great, Great, Great Grandad. He worked for Barber and Walker at Brinsley Colliery. He lived on Mansfield Road in Brinsley. The name that we knew him as was Gaffer Chambers as he was the Pit Gaffer. But what we do not know is his real name. If you have any information that you could send me regarding Gaffer Chambers this would be fantastic. Hi Fionn, In my list of Notts Mines, William Chambers first class certificate 437 was Manager at Brinsley and also Selston from at least 1888-1906 then in 1907 he is listed as Under Manager.